New photos document the continuing air pollution assault on neighbors including hundreds of students, teachers and staff at Woodriver Elementary School — directly across the street. DEC takes no notice. 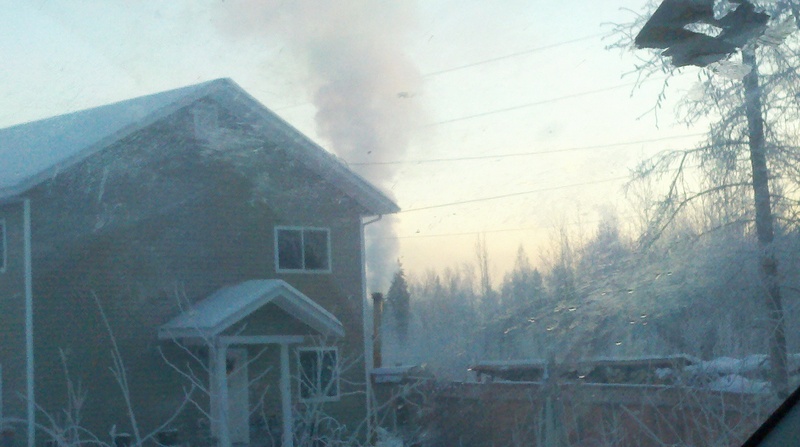 This situation is painfully ironic because this is the ONLY wood smoke emitter DEC has ever put “on notice” in the Fairbanks-North Pole PM 2.5 nonattainment area. The owner of two rental duplexes across from Woodriver Elementary School burns wood in two outdoor boilers to avoid using existing fuel oil heating systems. DEC inspectors need to take just 15 minutes of their time to verify that a violation is occurring. More than 140 reports of burning eyes, asthma attacks, and other medical harm have been filed with the state and borough. Tell him how you have been harmed. Insist that he direct DEC to enforce the law to protect public health! How can DEC stand idle as Woodriver is subjected to its 5th winter of harm? 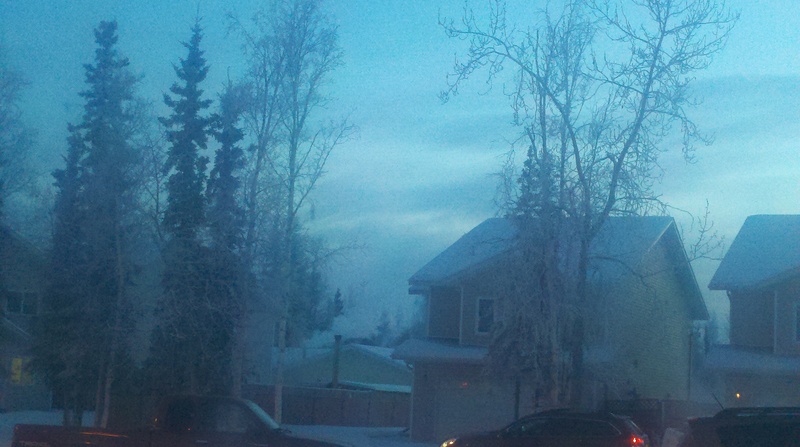 Fairbanks has been under DEC air quality advisories for the last 13 straight days. DEC has no excuse for ignoring the heavy smoke emissions at Woodriver. DEC gave the owner “notice” two winters ago! “ADEC’s investigations have determined that the boilers located at 58 Trinidad Drive and 5055 A and/or B Palo Verde Ave, are the main sources of the poor air quality at the Woodriver School and the intersection of Trinidad Drive and Palo Verde Avenue…. Avoid operating the boilers…in a manner that causes A) black smoke; or B) visible emissions that exceed 50 percent opacity for more than 15 minutes in any one hour in an area for which an air quality advisory is in effect under 18 AAC 50.245.” Yet, DEC fails to notice the smoke or the violation of laws to protect public health. Special thanks to the concerned neighbor who shared these photographs. Today, Nov 18, 2011, PM 2.5 hourly readings climbed to over 100 micrograms/cubic meter in downtown Fairbanks and also in North Pole. 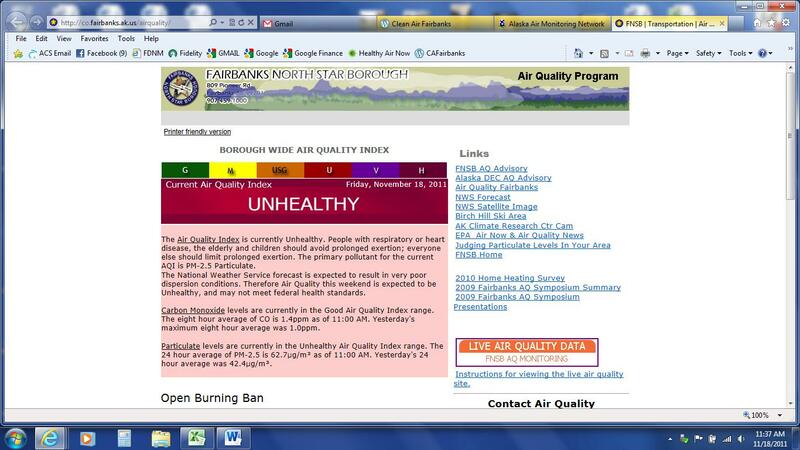 The Borough took note of the rising PM 2.5 and declared air quality UNHEALTHY. The Fairbanks area is the only Alaskan community in PM 2.5 nonattainment. Online real-time monitoring is available from two monitors in downtown Fairbanks and one at North Pole Elementary. The Alaska DEC again missed the boat. Despite the rising PM 2.5, DEC has not updated yesterday’s UNHEALTHY FOR SENSITIVE GROUPS advisory at the time of this post. DEC staff in Anchorage monitor air quality here in Fairbanks. Today, Nov 18, 2011, all six Anchorage monitors were well below the state and federal 24-hour PM 2.5 standard of 35 µg/m3.